Great size and shape and of course the glow in the dark ? Great size and shape for any baby's mouth. Also the handle is great for finding in the night. Saved me a few times. Also you can easily add a dummy clip to it as well. The supermarket baby event always have these really great price. Easy sterilisation. Definitely need more colours and designs. 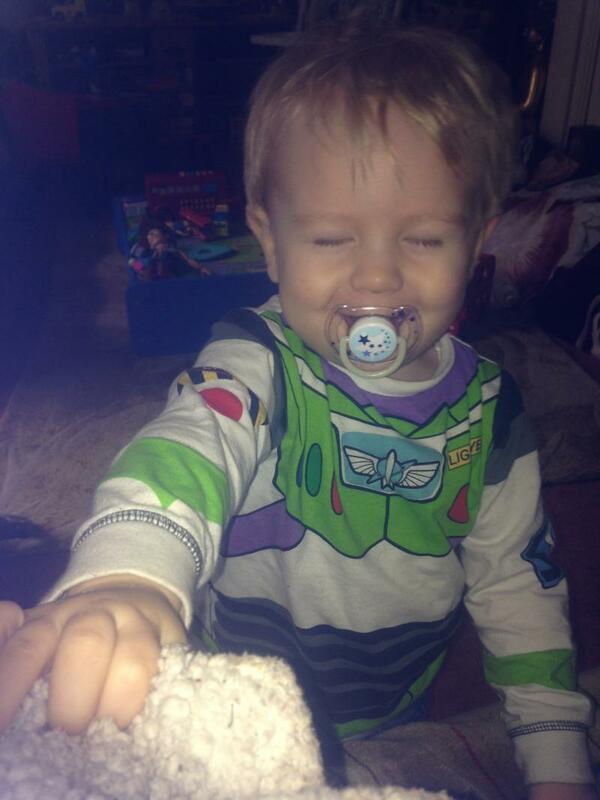 Feel like my boy has never had his dummy changed. I have always bought Phillips dummies. There caught my attention as I thought would be easier to find in cot. Not so easy as the glow in the dark is very dull. 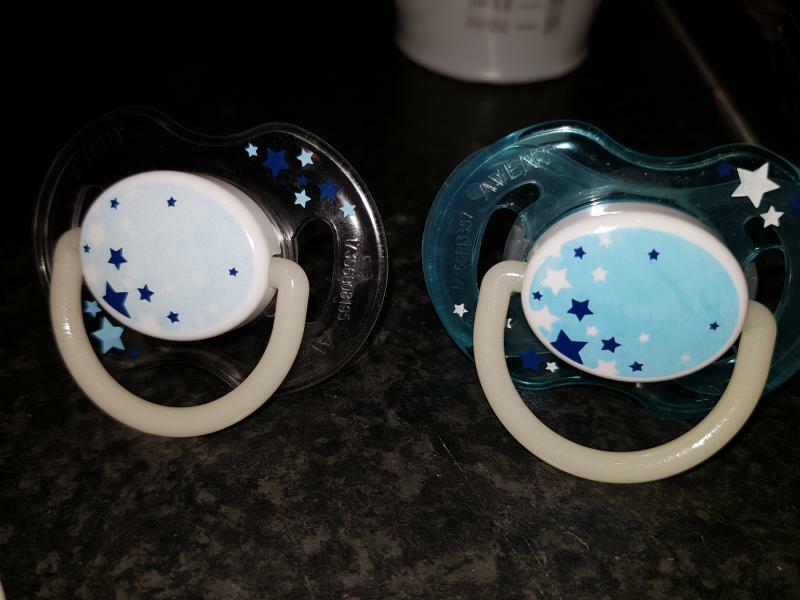 I really like these dummies, I use in the day time too when needed, they glow in the dark making easy to locate in middle of the night my baby loves them helps her to get to sleep and helps calm her down when she is having a major crying session! Bought two packs of two the blue set and the pink set, so I always have a spare if she drops one! I used this product from 6 weeks - 2years. It is a great product and i would not use anything else. I feel the product is not as harmful on teeth as some could be and with a hygiene cap to cover the bit where it goes into the babies mouth means when its not being used it is kept clean. I always brought the glow in the dark ones but it is on the tiny handle at the end that glows and to be honest it was pointless in the middle of the night it did not make it any easier to find. My boy loved these dummies and i would reccommend definitely. Depending on when baby gets there teeth can easily be bitten into if the child tries hard enough. Overall I'm pleased with this product , I have found them to be better than any other dummy out! Both my son's have used them and liked them! Price can be a bit expensive. Great shape and easy to clean. Could be brighter in the dark. These dummies were recommended by a friend as they are easier to locate in the dark than my son's normal dummies. We have always used Avent as their shape is easier for our baby to keep in his mouth and they are easier to clean. These dummies are also easier to keep clean as they have a easy clip case which is the invaluable. The only negative is that they are not as bright as I thought they would be but otherwise they are fabulous. Very good dummies, would highly recommend. Looking at my sons teeth you would never say he uses a dummie which was my biggest worry! I reluctantly bought these dummies after having the recommended to me (waited til Asda had their 2 packs for £6 kids on) but I’m so glad I had these, both my boys loved their dummies and would on my take the advent brand, they were also the orthotic ones so better for their teeth. Loved the glow in the dark ones for easy to find at bed times! These are by far the most attractive dummies I’ve found. They glow in the dark so are easy to find when baby spits them out in the night. Love them. Baby loves them. Sterile cap to ensure dummy stays clean. 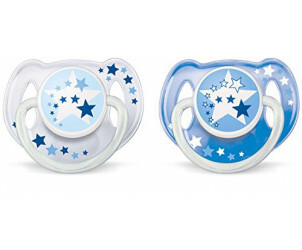 My baby absolutely loves these dummy, i have used them with all my children. The cap allows the dummy to stay sterile when out and about. Overall brilliant product. Great dummy, little one loves it and always picks this one out of her bunch first finding it most appealing. Great night handles which are a life saver when she wakes in the night for them, only downside is they are quite expensive but that's the same with most dummies across the ranges. Child absolutely loves these dummies, definitely their favourite and only takes to these. They are the perfect size and easy to clean they don't go mouldy or dirty like some do and they are cute. Definitely recommend these as child loves them just need other variations now. Philips Avent dummy quality is saver. My baby love the dummy anytimes. Specially for night time sleep. I also love the pic of these dummies, so I brought 3 set for my baby and they come with the plastics box that is very good to keep the dummies in the bag. No need to use a long time to find it. Great dummies, the only dummies my son would take. These ones in particular were great, as babies are ALWAYS losing their dummies in the night. It’s easy for both me and the baby to find half asleep and in the dark. We have only ever bought these. Really good style dummy. Love that they glow up so you can find them in the night. This style was the only ones I could get my little one when he was born all the others was too big for his little mouth due to him being small. Glows in the dark so easy to find in the night. Can never find them on offer are a bit more expensive compared to others. My LG will only use avent dummy's so we have a fair few. However the glow in the dark ones are definitely my favourite especially in the middle of the night! Easy to clean they have cute little pictures on them (not many designs available) however they are fabulous. The hygiene clip is great so when I'm out and about I always carry a spare unclip and use! Like all dummies you have to keep an eye on your child with them but my baby really loves this and for some reason he sleeps longer with it. Philips Avent night time dummy are a life saver. Amazing help for during the dark nights and also helpful for little ones to find themselves. I also love the fact these dummies come with their own safety clip. This is a great idea. Easy to store without risk of dirt getting to them. The glow in the dark handle is brilliant. My daughter is fussy with dummies and she likes these,unfortunately I find them quite expensive especially when their so easily lost. I love the glow in the dark bit as it saves crawling about on yours hands and knees looking. Really great value dummies, love,love ,love the cap to keep them germ free and they glow in the dark which is a God send during the night . Used these dummies for all of my babies and I’ve found they are the best ones I’ve used. Big, colourful, glow in the dark and individual caps for the dummies. As a dummy these are good but do not by for the design as the picture does not last. Very good shaped dummy but does not glow in dark for long. 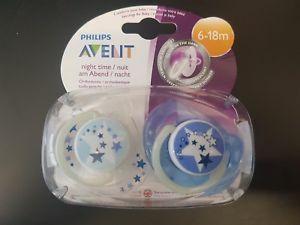 The Philips Avent night dummy has a glow-in-the-dark handle.